The most common benign change in the liver is hemangioma. It can occur at virtually every age and is often present in multiple forms. Diagnosis is usually made incidentally since it rarely causes pain. Only with increasing size do complaints arise. Contrast-enhanced multiple-phase CT shows a typical „ iris diaphragm phenomenon“. The contrast agent typically fills the hemangioma beginning at the margin, making this phenomenon pathognomonic for hemangioma. Because hemangioma is not malignant, the decision for surgery is made with caution. Resection should only be considered if symptoms arise due to displacement or if there is a risk of rupture of a giant hemangioma. FNH is especially common in women who take oral contraceptives. These lesions resemble tumors but are not malignant. Only large nodules that have become symptomatic should be resected. Otherwise, the first step in treatment should be discontinuation of the causative drugs. In diagnostic imaging, FNH exhibits a typical wheel-spoke pattern caused by the fibrous septa that form central star-shaped scar tissue on histology. Accumulations of pus in the liver can also appear as masses in diagnostic imaging. These masses rarely remain asymptomatic, often being associated with a pronounced feeling of sickness, fever, chills, and signs of sepsis. The cause is usually an abscess-forming biliary infection like cholangitis. Infections in the hepatic portal system (portalen Stromgebiet) can also cause liver abscesses, caused for example by a sigmoid perforation associated with diverticulitis. Sepsis of other genesis can cause an abscess in the liver. As for all abscesses, the basic principle applies: ubi pus, ibi evacua!, where there is pus, there evacuate it! Every abscess must be drained. This can be done surgically in the liver by the placement of multiple drains. If the abscesses are small, interventional-radiology can be used for CT-guided placement of drains. Adenomas also occur in the liver. Like FNH, they are often triggered hormonally, i.e. by the taking of oral contraceptives. Since a malignant degeneration cannot be rules out, there exists at least with progressive tumor growth an indication for surgery. Although this parasitic disease is more common in Mediterranean countries, it does occur in Germany. It mainly affects risk groups working in agriculture and forestry. A distinction can be made between cystic echinococcosis, which is caused by the larval stage of dog tapeworm (Echinococcus granulosus) and alveolar echinococcosis, which is triggered by fox tapeworm (Echinococcus multilocularis). The former is characterized by large chambered cysts, the latter by small alveolar cysts which have an infiltrative growth pattern. This, and the fact that a ruptured cyst can lead to a peritoneal effusion, give reason to question whether these liver lesions can be truly regarded as benign. Surgery on echinococcosis should be performed with the same care and caution as oncological surgery. Humans were not even foreseen in the developmental cycle of dog and fox tapeworms and are superfluous in their life cycle because they do not excrete the parasites. Humans are not the final host for the parasite, but a false intermediate host, a dead end so to speak in which dog and fox tapeworms lose their way. Treatment consists of surgical resection or the PAIR technique in which the cyst is punctured, aspirated, a chemotherapeutic agent injected for 15 minutes, and the cystic contents reaspirated. A combination of these procedures is also possible, generally involving adjuvant therapy with albendazole or mebendazole. The surgical term for this procedure is cystectomy, in which the contents of the cyst are removed from its capsule. 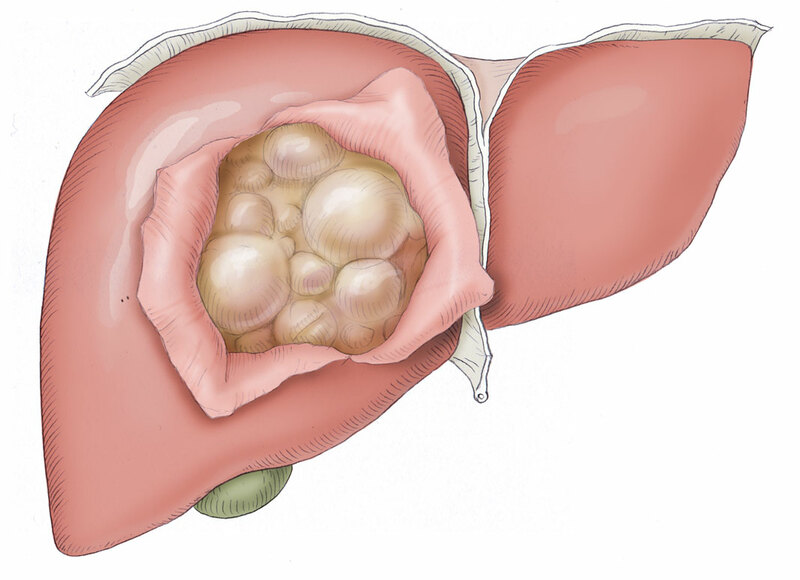 To lessen the risk of perforation, a pericystectomy can be performed that includes resection of the healthy liver tissue surrounding the cysts. If multiple large cysts are present, a hemihepatectomy may be necessary. Care must always be taken that the cysts are not perforated as this would result in a peritoneal effusion.